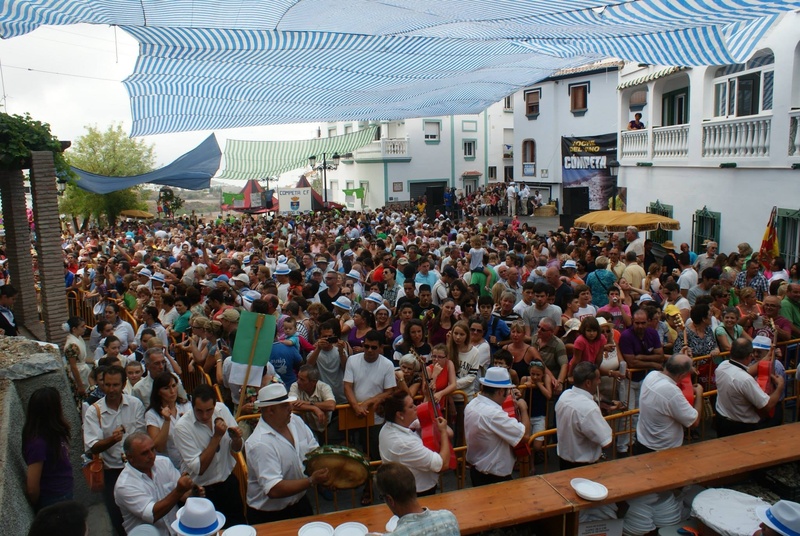 Each 15 August sees the return of Cómpeta’s annual fiesta ‘Noche del Vino’. Always a very special event, it was made even better this year by the visit of my daughter and grandson, and of course my son-in-law, for a week’s holiday. As forecast the day was rather overcast but still very hot and humid. We didn’t catch the full programme of events which start with a mass at 11am, after which the fun begins. 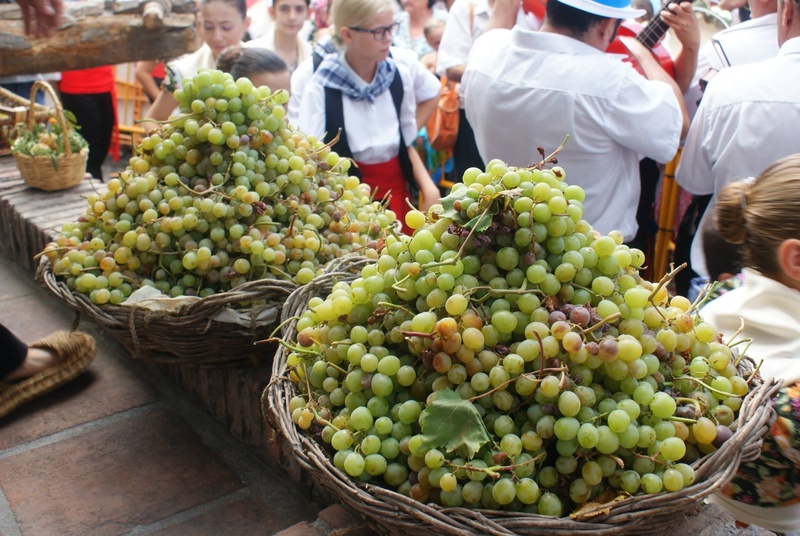 At 12 noon traditionally dressed farmers carry baskets of grapes on their heads through the assembling crowds towards the treading platform. This is followed by dancing and singing by local groups and professional troupes. 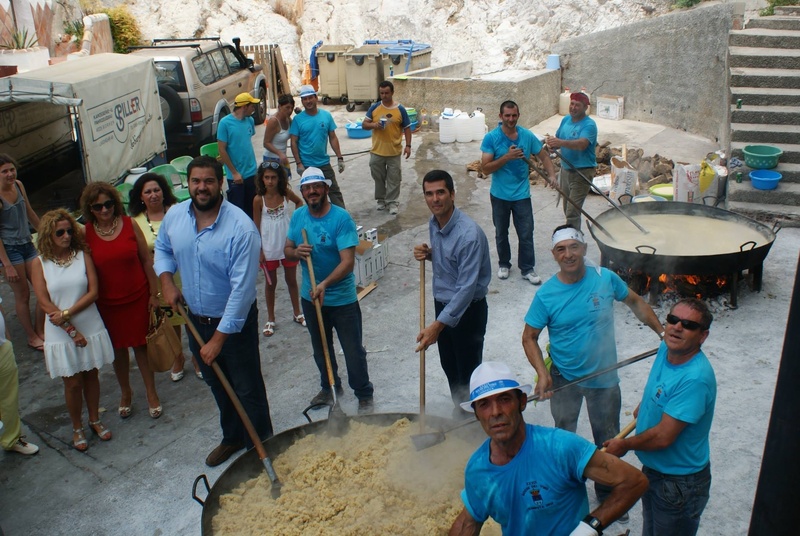 Free food and local Cómpeta wine is provided for one and all. 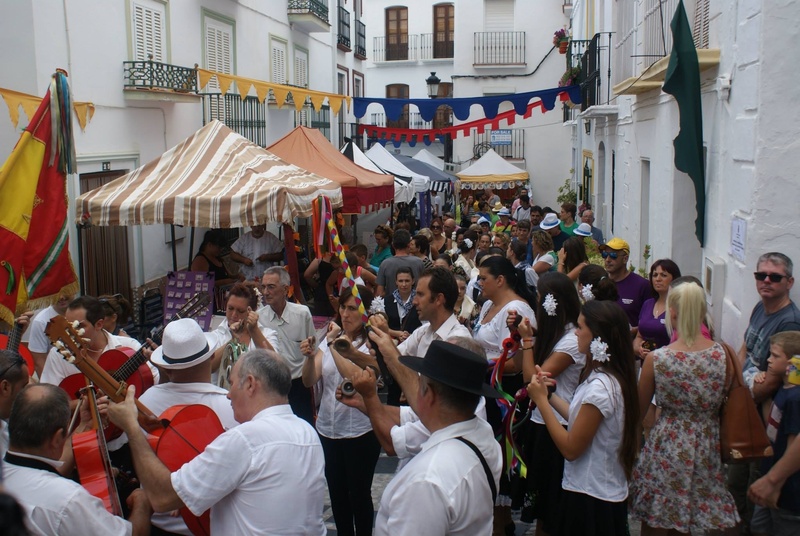 The winding streets are bedecked with bunting and craft stalls to provide a feast for the eyes. After a late afternoon break in activities, the fun starts again at around 10pm with a programme of professional flamenco performances on the pretty stage set up in the main Plaza Almijara. I made a full report of the day’s events last year which you can see here, complete with a couple of videos. This year it was not possible to join in with all the fun because my grandson didn’t have the stamina to keep going all day (in truth, neither did I), but I have put together a slideshow of some of the entertainment we caught during the day, and I have found the following beautiful photographs posted onto the Cómpeta townhall Facebook page. I have never seen so many people packed into the square for the first evening performance, all wanting to see the ‘wunderkind’ – 9 year old Raul “El Balilla” who has an incredible voice and has become something of a phenomenon after appearing on a spanish TV talent show. As he left the stage he was followed by a procession of gaggling young girls hoping for a final glimpse of their hero. The crowds dissipated a little after the mini maestro departed and we were able to find a seat down in the square and spent a few hours in the cooling night air before leaving the square at 3am and walking home along the goat track in light rain. Please take a look at this slideshow – there are some lovely photos of the dancers throughout the day – and a few less expected sights, like a couple of random piglets. The music that accompanies the slideshow was written and performed by our very own Mitch France otherwise known as the front guy of our local band ‘The Rooters’. Trepidatious Traveller on Facebook or Twitter. 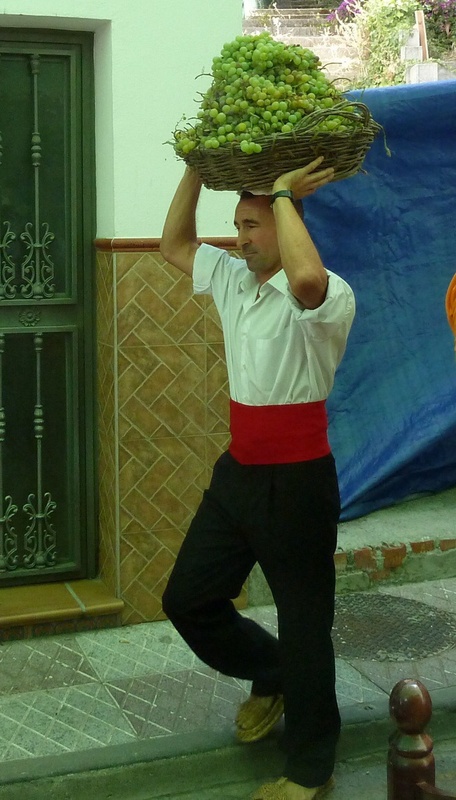 This entry was posted in A view of life, Expats in andalucia and tagged Cómpeta, El Balilla, Expats in Andalucia, flamenco, night of the wine, Noche del Vino XXXIX, Spain, Spanish fiestas, travel. Bookmark the permalink. Lovely images, lovely music and again a lovely account of events. It was three years ago that we last attended the noche del vino, and like you it was made all the more special as we were with some family members. We miss Competa enormously so are pleased and greatful for your postings….they really do bring all the memories flooding back, thank you. Hi Jan. Thanks for your comment. I’m very glad to be able to bring a littl bit of complet to you. Where are you now? A lovely post and an excellent slide show with the music up to the standard we have come to expect from Mitch. A great day. Great post and links as always Maggie. Just another celebration I was unable to attend. It’s a fabulous occasion Tess – like I’ve said before – the spanish certainly know how to throw a party! Fantastic slide show! Must have been a wonderful celebration–left me yearning to have been there! Thanks for posting. Thanks Leona, it was a fabulous day – always is! Wonderful, wonderful slide show once again capturing everything. Thanks Cindy – made all the better for Mitch’s music. ah. such beautiful romantic music. such a nice display of photos from the event, too. looks so old world and cultural. thanks for sharing! You are welcome. I also ordered the book. Haven’t started it yet…too many other things to read at the moment…and I am getting ready for the Camino…I leave Seattle Sept. 23rd! Make sure you see the movie…that is what I fell in love with!! Only a month to go – you must be so excited. I can’t remember – have you walked the camino before? No, haven’t walked it before. I am a newbie!! I think I finally figured out my shoe and sock combo. Was starting to get nervous about that. Ended up with Brooks Cascadia Trail Runners. Tried them out this morning on a 7.12 mile hike and with my Vaseline laden feet wrapped snuggly in Injinji toe socks and Darn Toughs…all went well. And I plan on living in them for the next month so they get to know my feet real good. Your blogs and advice have been excellent to get a feel for what I will expect. I’ll be interested to know how you get on with the injinji socks – they always look a bit cumbersome to me. I would just advise to use the best insoles that you can find – they might ease a bit of suffering during the second half of your day’s walk. Are you going to be blogging or updating on Facebook along the way – I would love to follow your progress. Buen camino! Thanks for the advice about the insoles. What kind did you take? I have Green Superfeet…but they feel so hard. I also have Blue Superfeet…and they feel ‘not’ so hard. I have just been walking in the insoles that the Brooks Cascadia came with. I know that will change….but they feel so nice an cushiony with them. I plan on bringing a harder insole and a softer one…so I can switch out…when my feet start to complain. That looks lovely and the music was excellent.. Very tempting to visit! If you are ever in the area, be sure to let me know. We are about an hour from Málaga. I spent 2 months in Malaga 43 years ago. (I had to count on my fingers and was a bit shocked.) I don’t suppose I could recreate that situation! I expect it’s all changed a bit since then – but it remains a beautiful city – I don’t go there often enough. Did you enjoy your time here?